Travelers Rest Lodge offers authentic park style cabins, nestled in the aspens. Cabins include fireplaces, kitchenettes and roomy covered porches. Beautiful views. 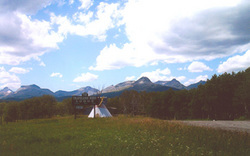 Close to Amtrak, Lewis and Clark sites, Glacier National Park and the Bob Marshall Wilderness. Directions: Travelers Rest Lodge is on the east edge of East Glacier Park, Montana, on Highway 2.